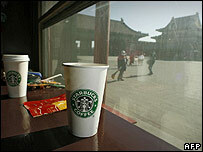 A Starbucks coffee shop in Beijing's Forbidden City palace could close following a massive online protest over its presence on the historic site. A palace spokesman was quoted by state media as saying they were considering whether Starbucks would remain after a major renovation of the site. A China state TV personality has led an online campaign to have the US coffee giant's outlet removed from the site. Rui Chenggang said its presence "trampled over Chinese culture". He has reportedly won the backing of more than half a million internet users, the China Daily newspaper reports. Palace spokesman Feng Nai'en was quoted as saying that they were "working with Starbucks to find a solution by June in response to the protests." "Whether or not Starbucks remains depends on the entire design plan that will be released in the first half of the year," he was quoted by Xinhua news agency as saying. He said a third of the shops in the 71-hectare (178-acre) Forbidden City complex had already been removed during the renovation. The Starbucks coffee shop has caused controversy since it opened in 2000. It is one of more than 200 that have opened in the vast country since 1999. Rui Chenggang, an anchorman for China Central Television, wrote in his blog that the shop's presence in the Forbidden City was "not globalising but trampling over Chinese culture". Starbucks has defended its outlet, saying the firm "appreciates the deep history and culture of the Forbidden City and has operated in a respectful manner". "We have provided a welcome place of rest for thousands of tourists, both Chinese and foreign, for more than six years," the company said in a statement. The Forbidden City, which is also known as the Palace Museum, was built in 1420 and was home to 24 emperors until the end of imperial rule in 1911. It is China's top tourist attraction and a Unesco World Heritage site.